Especially for the modern performer, The Ave Maria Collection is a newly engraved and expertly edited collection by Edwin McLean. 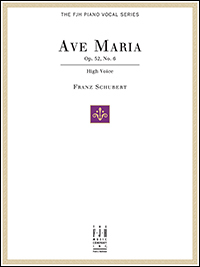 This authoritative edition contains Schubert's Ave Maria for high, medium, and low voices, as well as Ave Maria by Bach-Gounod for high, medium, and low voices. In addition, a piano solo version of Schubert's Ave Maria is included as well as a brief history of both versions. This beautiful arrangement of the sacred American anthem achieves a grand sound while remaining accessible to the late intermediate performer. With its hymn-like setting, octave doubling in the bass, and sophisticated voice leading, it makes a perfect selection for all occasions. Complete verses provided. 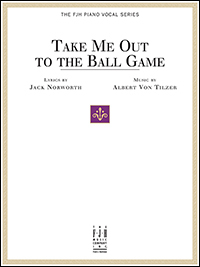 This engaging arrangement of a sing-along standard is easy on both singers and pianists. Starting on Middle C, the melody (with lyrics) is presented on a separate vocal line and doubled in the piano. Chord symbols are supplied so that other musicians can play along. This classic arrangement of the American anthem is sure to fill the heart of every listener with great pride and joy. 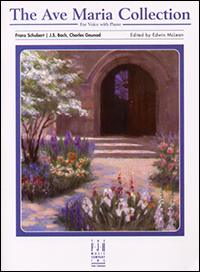 Beautifully arranged in hymn-style and set in the key of G major, this solo is ideal for all performance settings. Complete verses provided. For Low Voice and Piano - An extremely expressive and beautiful piece, Ave Maria has been a traditional favorite for church performance. This timeless masterpiece by Bach-Gounod is presented in low voice. For High Voice and Piano - An extremely expressive and beautiful piece, Ave Maria has been a traditional favorite for church performance. This timeless masterpiece by Bach-Gounod is presented in high voice. For High Voice and Piano - An extremely expressive and beautiful piece, Ave Maria has been a standard at weddings for generations. This timeless masterpiece by Schubert is presented in high voice; lyrics are in Latin, English, and German. For Medium Voice and Piano - An extremely expressive and beautiful piece, Ave Maria has been a standard at weddings for generations. This timeless masterpiece by Schubert is presented in medium voice; lyrics are in Latin, English, and German. For Low Voice and Piano - An extremely expressive and beautiful piece, Ave Maria has been a standard at weddings for generations. This timeless masterpiece by Schubert is presented in low voice; lyrics are in Latin, English, and German. Bizet's ever-popular Habanera from the opera Carmen is presented here in its original piano/vocal form, but with a newly translated English lyric as well as the original French lyric. Expertly engraved and edited, this edition is a must for your piano/vocal library. 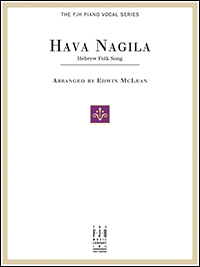 This lively traditional Hebrew folk song arranged for voice and piano, includes the traditional Hebrew lyrics as well as the English translations. The piano part is arranged to fully support the vocal part as well as stand on it's own as an instrumental solo if desired. Chord symbols are provided on top of the vocal line to facilitate possible variations in accompaniment patterns, or use of additional instruments. 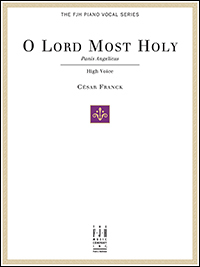 High Voice - César Franck's Panis Angelicus is presented here in its original piano/vocal form, newly edited with both Latin and English lyrics. 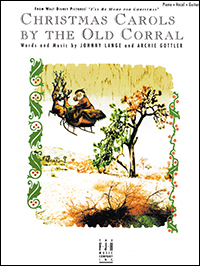 The fluid piano score often uses four-part choral voicing to support the angelic melody. This arrangement is written here for high voice, well within a mezzo-soprano's range. This exceptional edition of W.C. Handy's enduring classic, The Saint Louis Blues, is skillfully edited and engraved to reflect today's performance standards. A timeless piano/vocal blues that is sure to delight audiences for years to come.